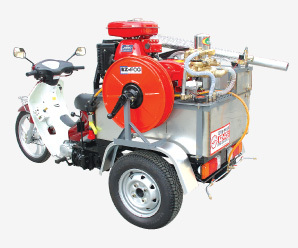 ﻿ Motor Cycle Sprayer System-IZ-1000S-3 wheel Fogging Equipment,kill fly-IZ-FOG Co.Ltd. 3. It is ideal for treating industrial,public place and residential areas where there are people and high risk for transmitting the virus. ....2. Motor cycle has a manual transmission → low speed, middle speed, high speed and rear move system. ....3. Assistance brake system - brake pedal push down - pull the oil pressure valve by hand. ........to the two wheels motor cycle in balance feeling. ........3) This machine has rechargable battery - start switch starting. ........4) Long time no use - separate the battery join line. ........5) The engine lube oil must be checked. ........3) The pressure cylinder grease and lube oil must be checked. ........ control box power on - spray button on - Automatic On , Off valve working - Spray nozzle control valve control. ..............open - air pressure take out.